Your free site membership allows you to add a Price alert for any symbol (based on the symbol's Last Price), along with News alerts for equities. Alerts are sent to the primary email address associated with your Barchart account. 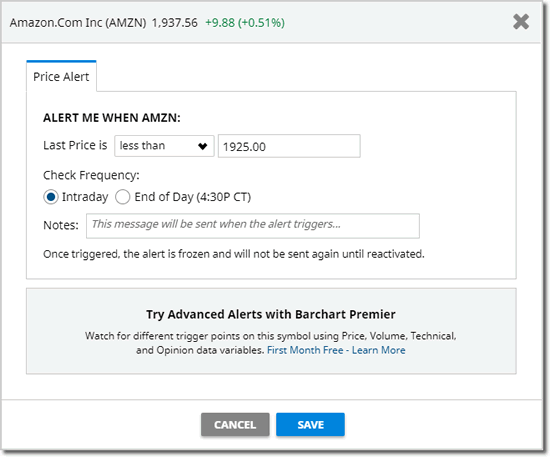 Barchart Premier members can configure complex alerts on Price, Change, Volume, Technicals and Barchart Opinions with optional receipt of price alerts via SMS text message. The Alerts Center is where you will find all your Active, Inactive, and Triggered Alerts. Use the Alerts Center to view when your alerts triggered, change or delete active alerts, and set new alerts. Your free site membership allows you to add one Price alert for any symbol (based on the symbol's Last Price), along with News alerts for equities. All alerts (both price and news alerts) are sent to the primary email address associated with your Barchart account. You can change this email address in the "My Profile" page. Barchart Premier members can optionally receive price alerts via SMS text message. By default, your account is set to always deliver triggered alerts to the primary email address associated with your Barchart account. This email address is configured in your Profile page. If you uncheck this box, your only notification for triggered alerts will be the data you see available on the Alerts Center page (unless you are set up to receive Text Alerts). Look for the date and time in the Triggered column on the page. The Text Alerts button allows Barchart Premier members to configure text messaging. Click the "Text Alerts" button. Enter and verify your phone number where you want to receive text alerts. Important: You must enter the verification code sent to your phone before you can receive text alerts from Barchart. Once verified, open the "Text Alerts" setting again, turn SMS text alerts on by checking the "Price Alerts" box, and set the times you wish to receive the alerts. This button, found at the top right corner of the page, will stop ALL price and news alerts - both email and text - from sending. When you click this button, the "Active" check box on every alert will be disabled. This setting can be helpful if you want to suspend alerts during a time of absence from trading. When subscribed, Barchart sends text alerts to your mobile device from (312) 554-3834. You may cancel your SMS subscription for all alerts by responding STOP, STOPALL, UNSUBSCRIBE, CANCEL, END or QUIT to any alert received on your mobile device from Barchart. This does not deactivate or remove alerts from your Barchart account. You will continue to receive emails for any subsequent alerts that trigger. If you wish to opt back into receiving SMS messages, you must do so from your mobile device. Send START, YES or UNSTOP to (312) 554-3834 to reactivate your SMS subscription. Get an email alert when a symbol's Last Price is greater than or less than a target value you set. Optionally add Notes to the alert, which will be sent along in your email notification. Note: For Premier Members who set alerts on any of the Technicals fields, the Technical data checked is always the Daily data. In other words, setting an Intraday alert on a 20-Day Moving Average will only check the status of the moving average from the previous day's close. End-of-Day: the condition will be checked once at 4:30P Central Time. Even after triggering, End-of-Day alerts stay in an active state. The condition of the alert will continue to be monitored until you either deactivate or delete the alert. When setting a News Alert for an equity symbol, you can identify the News Sources to monitor. Any time the symbol is mentioned in a story, an alert notification email will be sent with a link to the story. Important: News Alerts are "continuous" alerts, meaning you will continue to receive them as long as the alert is "Active". To stop receiving News Alerts for a symbol, either delete it or uncheck the "Active" setting. You may add an alert for a symbol by entering the symbol in the text box at the top of the page. If an alert exists for the entered symbol, the Alerts modal appears and you may activate the alert, edit and change the target value, or delete the alert if desired. Additionally, you may add or edit alerts from any symbol's quote page. If there are no alerts set for the symbol, you can proceed to enter either a Price or a News Alert. The Alerts page lists all alerts, alphabetically by symbol. Use the "Filter by symbol" at the top of the page to look for a specific symbol's alerts.